This brings up a dialog box. Depending on what kind of computer you have, this may say something slightly different, but the gist is the same: Choose a file from your hard drive. This opens a navigation interface. 3Select your desired photo and click Select or OK. This brings you back to the Getting Started Wizard, except now there’s a preview of your new profile picture. Make a good first impression. Your profile picture is one of the first ways people interact with your Timeline and how you choose to represent yourself. Sometimes, profile pictures include other people — friends or significant others. Other times, location matters. If the first photo you see of someone is at the beach versus sitting at his desk, you may draw different conclusions about that person. What picture represents you? Consider who will see your profile picture. By default, your profile picture appears in search results that are visible to all of Facebook and can even be made available to the larger Internet population. So, generally, people who search for your name can see that picture. Make sure it’s something you’re comfortable with everyone seeing. Pick a photo you like. As you use Facebook, you actually wind up seeing your own photo quite often. Small versions appear wherever you make a comment, post something, or are part of a group. So pick a photo you like looking at. You’re not stuck with it. 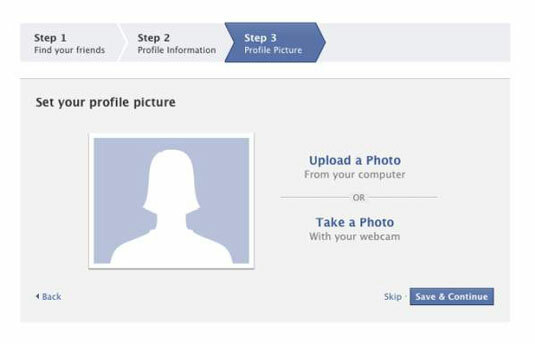 Keep in mind that you can easily change your profile picture at any time. Is it the dead of winter, and that photo of you on the beach last summer is just too depressing to look at? No problem; simply edit your profile picture.